It was a beautiful, bacon-filled day when America was blessed with an all-breakfast sandwich restaurant last summer, and now, there's finally such thing as a restaurant that's almost totally devoted to the triangular snack/meal/cheese and meat vehicles known as nachos. Dreams really do come true. The restaurant, aptly titled Nachoria, opened earlier this month in the Bay Area city of Burlingame, CA, according to a report by SF Gate. The way it works is simple: you can choose a meat or veggie option (pollo asada, carne asada, shrimp, carnitas, battered white fish, ceviche, or vegetables) and the so-called "triangular art" purveyors there will serve it up on fried corn tortilla chips topped with a homemade cheese sauce, caramelized onions, green onions, roasted red peppers, and queso fresco. The eatery also offers tacos, quesadillas, and a few sides on its menu, but why in the world would you order anything other than nachos? While you may have had a similar idea under the influence of late night hanger, the restaurant concept was created by the founder and former CEO of Zappos.com, Nick Swinmurn. 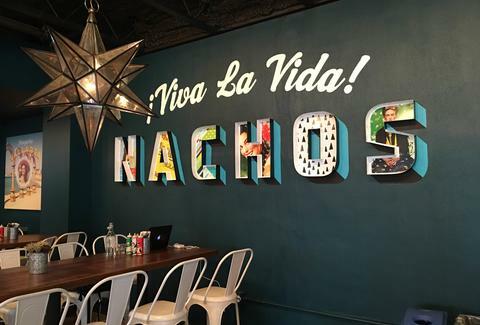 Among the other entrepreneurial endeavors he's pursued since the company was sold to Amazon in 2009, Swinmurn said he's long wanted to open a nachos-focused restaurant and finally found the opportunity to do so with Nachoria, according to the report. As for whether the restaurant will expand to more locations, Swinmurn said he wants to make sure he gets it right with the current restaurant first. But then again, how can you possibly go wrong with nachos? Tony Merevick is Cities News Editor at Thrillist and is officially craving nachos now. Somebody send help! Send news tips to news@thrillist.com and follow him on Twitter @tonymerevick.